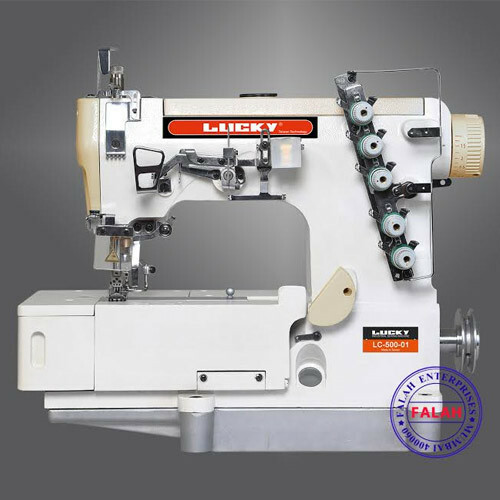 LUCKY LC-W500 FLATLOCK MACHINE IS FOR REGULAR COVER STITCHING AND CAN BE EQUIPPED WITH VARIOUS ATTACHMENTS FOR DIFFERENT SEWING SUCH AS,TAPE BINDING, COVERING,THRED PLAIN SEAMING ETC. IT CAN HAVE PLAIN SEAMING ON THE BOTH SIDES OF THE FABRICS. THANKS TO FLATBED TYPE, WIDE FABRIC CAN BE EASILY FEED, THIS MACHINE SUITABLE FOR KNITTED UNDERWEAR, SPORTS, SHIRTS AND TROUSERS ETC.THIS MACHINE ADOPTS COMPLETE CLOSED AUTO LUBRICATION SYSTEM, AND MAIN DRIVE ADOPTS TIMING BELT TO ASSURE HIGH SPEED AND LOWER NOISE. AVAILABLE FOR VARIOUS KINDS OF APPLICATIONS WITH ATTACHMENTS, ETC. Established in 1975, Falah Enterprises is an illustrious enterprise instrumental in trading top class products to our honored patrons. Some of the distinguished products provided by our enterprise comprise Industrial Sewing Machine, Portable Sewing Machines, Steam Iron, Cloth Cutting Machine and many more.